Save Straddie | In 1976 Fraser Island sand mining was stopped in just six weeks by Campbell Newman’s own father. You are here: Home » Politics of mining » In 1976 Fraser Island sand mining was stopped in just six weeks by Campbell Newman’s own father. In 1976 the Federal environment minister was Kevin Newman(father of LNP leader Campbell Newman). 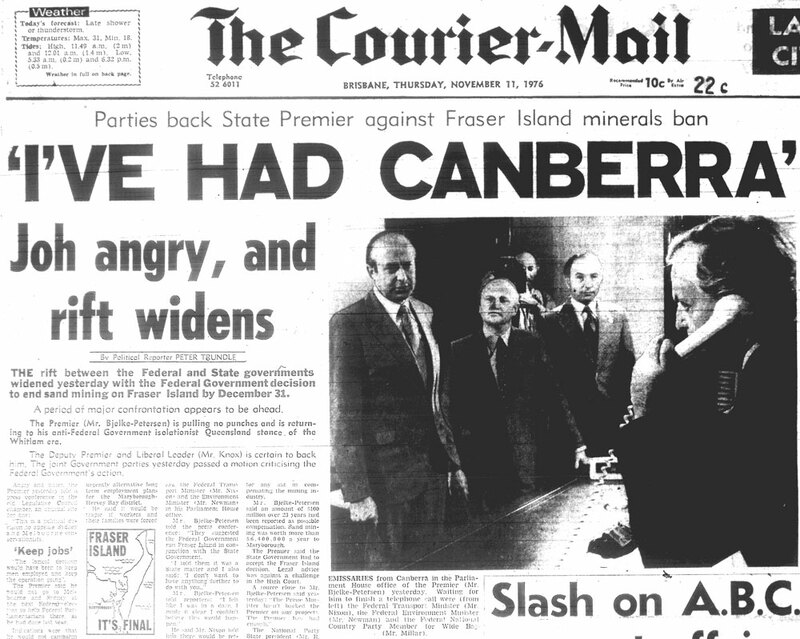 Kevin Newman told the then Queenlsand Premier Sir Joh Bjelke-Petersen that sandmining on Fraser Isalnded was to end in 6 weeks and was pictured on the front page of the Courier Mail(second from the left) confronting Sir Joh on the phone. Download (large pdf) more 1976 articles about the ending of sand mining on Fraser Island. Campbell Newman and his Liberal National Party use the same anti-environment arguments that Joh Bjelke Petersen unsuccessfully used in arguing for a continuation of sand mining on Fraser Island. It is now the 35 year anniversary of the end of sand mining on Fraser Island (ended in December 1976). Anna Bligh and Campbell Newman have so far failed to act decisively and end sand mining on North Stradbroke island. 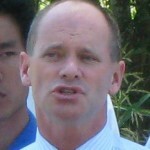 Campbell Newman uses the same arguments that Joh Bjelke Petersen used to support sand mining Fraser Island. 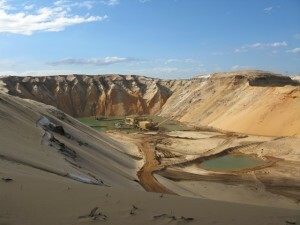 “The environmental aspects of decisions having the effect of permitting mining of all or any of these [Fraser Island sand mining] leases will involve major permanent and irreversible environmental harm to the landscape, vegetation and lakes of the island and, consequently, substantially damage its value to the Australian people”. See news article. November 11 1976. SMH Page 1. 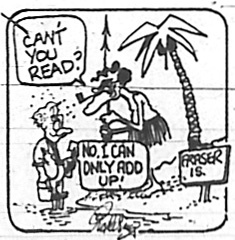 ‘Dec 31 ban on Fraser Is exports. By Michael Steketee. 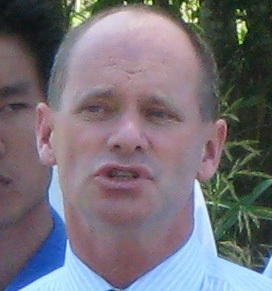 Campbell Newman’s father, Kevin Newman, then Federal Environment Minister, had the courage and conviction to personally confront Premier Joh Bjelke Petersen to explain how the Federal Government had decided to stop Fraser Island sand mining in just six weeks.Bjekle-Petersen then launched an attack on Newman Snr saying “I’m disappointed in the Prime Minister over this irresponsible and incredible decision”. See article. Unsuccessful argument # 1. Any decision to end sand mining is merely for the ‘Green’ or ‘environment’ vote, or for people in other places. The Federal Government was chasing votes in Sydney and Melbourne. Campbell Newman’s father, then Federal Environment Minister Kevin Newman said this claim of chasing votes was ‘silly’. See ‘Hard decision’ article Courier Mail 11 November 1976. We won’t, in an effort to buy Green preferences and Green support, in what (Labor) see obviously as a difficult election for them, just make decisions that then cost jobs. The Save Straddie answer: Straddie is loved by people from across south east Queensland and there is broad support for ending sand mining. Althouigh mining is an important part of Queensland’s economy, that does not mean mining is OK anywhere and everywhere in our wonderful state. Some places are just too precious to mine, places like Fraser Island and Stadbroke Island. “The logical decision would have been to keep men employed and keep the [sand mining] operation going.” See article. We won’t, in an effort to buy Green preferences and Green support, in what (Labor) see obviously as a difficult election for them, just make decisions that then cost jobs. See article. “In summary what is going to happen is that it is going to hurt people, it’s is going to cost jobs and it is about the politics of Greens preferences,” See article. The Save Straddie answer: Straddie’s economy is reliant on the natural environment, sand mining is destroying opportunities for future jobs. Due to the highly destructive nature of sand mining, there will be many revegetation jobs available for 15-20 years. The mining industry across Queensland is screaming out for skilled mining workers. So now is the right time to end sand mining on Straddie. See more about how sand mining destroys jobs. Note: The Federal Government funded a comprehensive compensation and jobs package for Fraser Island sand miners. All mining leases throughout Ausralia are now suspect because they can be rendered inoperative at any time by the withdrawal of export licences. Queensland Parliament Hansard, 11 November 1976, page 1483. Yesterday, Mr Newman said the North Stradbroke decision raised questions about sovereign risk and he was concerned mining companies might be unwilling to invest in Queensland. The Save Straddie answer: Mining corporations consistently roll out the ‘sovereign risk’ argument whenever governments make policy decisions in the public interest. For more about sovereign risk and Straddie, and more about ‘sovereign risk’ generally and see the Gruen Planet discussion about how the mining companies manipulate public policy. Download the full Fraser Island Environmental Inquiry report: Part One, Part Two. First report of the Commission. 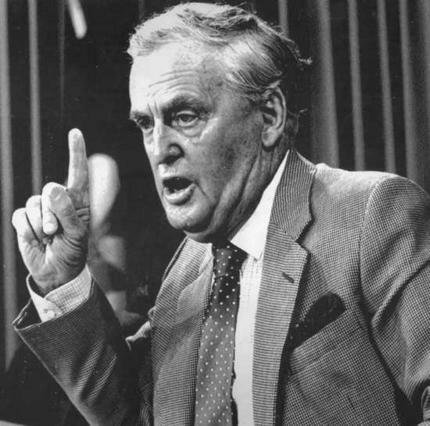 Premier Bligh refuses to acknowledge that sand mining causes ‘permanent and irreversible environmental harm’.=, as Malcolm Fraser acknowledged. Instead, Premier Bligh announced in State parliament this year her government would extend Stradbroke sand-mining leases for another 15 years: “I now announce that all mining will cease on North Stradbroke Island by 2025.” Hansard 22 March 2011, see page 611.